“As I submitted them I thought to myself ‘I'm so lucky, not only am I preparing to head into the United States Senate to serve our great state as the first woman senator in our state, and as the first social worker, but I'm equally proud of the fact that, as of this morning, I've finished my 16th continuous year of teaching in the School of Social Work at ASU,’” Sinema told an audience at a School of Social Work reception held at the Westward Ho Concho room in downtown Phoenix Monday evening. With about 100 social workers in attendance, Sinema used the opportunity to get recommendations for new staffers. 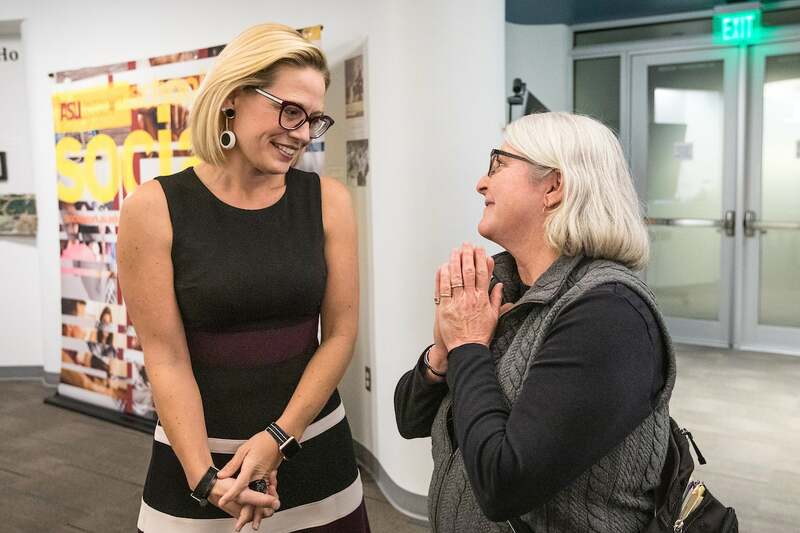 Since her election to the United States House of Representatives in 2012, Sinema has exclusively hired social workers with graduate degrees or MSWs to serve in her casework office. She plans to hire more as she now represents the entire state.